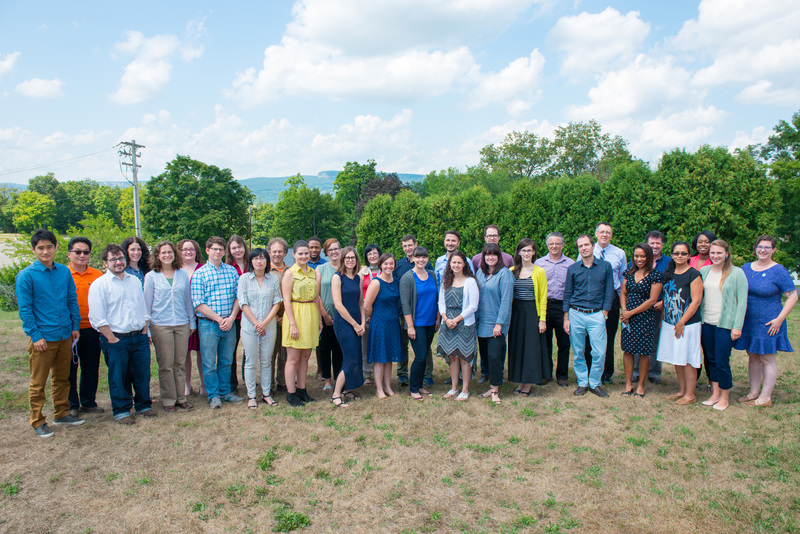 SUNY New Paltz proudly announces the appointment of 36 new full-time faculty for the 2015-16 academic year. Dana Arthur (Communication Disorders) holds masters’ degrees in speech-language pathology and literacy education and is completing her Ph.D. in speech, language, and hearing sciences from the University of Connecticut. She is happy to be joining the Department of Communication Disorders, where she will teach research methods, foundations of language, and language disorders in the fall. Amanda (Mandy) Babirad ’10 (International Relations) (Sojourner Truth Library) is a reference and instruction librarian who received her M.S. in Information Studies at SUNY Albany. After graduate school, she worked in reference at the College of Mount Saint Vincent, as an information literacy instructor at ASA College and at Allegheny College, where she was part of a team of librarians that focused on flipped classroom design and introducing new instructional technology to the campus community. Babirad is a SUNY New Paltz alum and is excited to be back on campus. Lynn Batchelder ‘13g (Metal) is a Visiting Assistant Professor in the Department of Art’s Metal program. She received her B.F.A. in Metals/Jewelry from Western Michigan University and her M.F.A. in Metal at SUNY New Paltz in 2013. She was an Artist-in-Residence at the Arrowmont School of Arts and Crafts and a Visiting Lecturer of Art Metals at the University of Wisconsin-Stout. Batchelder has most recently exhibited her work in the “Talente” exhibition at the International Trades Fair in Munich and in a solo show at the Heidi Lowe Gallery. Her work is rooted in the drawing process; translating the quality of the drawn line into metal as she seamlessly moves between creating jewelry, objects and drawings. Jacquelyn (Jackie) Berry (Psychology) has considerable experience with both research and teaching and specializes in psychological experiments involving visual perception. She holds both a B.S. and an M.S. in Psychology and an M.B.A. from Rensselaer Polytechnic Institute. As a graduate student, Berry conducted a number of different research projects and also taught psychology at the undergraduate level. She completed her Ph.D. in Cognitive Psychology at the University at Albany and began teaching as an adjunct at SUNY New Paltz shortly thereafter. Berry taught numerous undergraduate psychology courses and served as a mentor to her students during her time as an adjunct at New Paltz. Frank Boyer (Art Education & Art History) is a Midwest native with longstanding New Paltz roots: his maternal ancestors were French Huguenots who were in New Paltz in 1685. Boyer holds a B.A. degree in English Literature from the University of Wisconsin-Madison and M.A. and Doctor of Arts degrees in Humanities and Art Theory, respectively, from the Steinhardt School of NYU. A teaching fellowship at NYU’s Expository Writing Program sparked his interest in teaching English composition to undergraduates and in using technology in the writing-intensive classroom. For the last several years his scholarship has focused on theoretical and educational issues in contemporary art. Boyer has also served as an artist-in-resident at New York City’s Tompkins Square Library, where he created installations that incorporated performance elements. Michael (Mike) Camargo ’07g (Mental Health Counseling) (Psychology) earned his M.S. at SUNY New Paltz and is a Licensed Mental Health Counselor and Board Certified Behavior Analyst. For almost 10 years, he has worked as a counselor and behavior specialist with children and adults with developmental disabilities throughout the Hudson Valley. He has worked as a co-developer of the Renaissance Program at Ulster-Greene ARC, an interdisciplinary program using humanistic psychology and behavior analysis to teach life skills to adults with autism, and as a clinical supervisor at Anderson Center for Autism, a private school for children on the autism spectrum. Additionally, Michael is the Vice President of the Rosendale Street Festival and an alternate board member for the Rosendale Zoning Board of Appeals. Min Chen (Computer Science) earned her Ph.D. and M.S. in computer science from North Dakota State University and her B.A. in Mathematics and Physics from the College of St. Benedict. Her professional interests lie in the general field of Artificial Intelligence with special focuses on applying fuzzy logic in data mining. Her current projects include applying fuzzy clustering techniques in image segmentation and developing QSAR/QSPR model for polymer design. Tyrell Connor (Sociology) grew up in Old Bridge, New Jersey. A first- generation college student, he received his B.A. in Psychology from Hampton University and his M.S. and Ph.D. in Sociology with a focus on Law & Society from Purdue University. He comes to SUNY New Paltz to instruct courses on crime and criminology. Melissa Feldmann ’13 (Second Language Education) (Haggerty English Language Program) began teaching as an adjunct at SUNY New Paltz in fall 2013. In addition to her teaching responsibilities, Melissa co-coordinates international student activities. If you are interested in reaching out to the international student community at SUNY New Paltz, please feel free to contact her at any time. Adolfo J. Garcia, (Communication) has a masters’ degree from the University of Wisconsin-Milwaukee and a doctorate in communication and conflict resolution from the University of New Mexico. He conducts research in conflict resolution and college-level learning. Garcia began at UW-Green Bay in 2007 where he taught in the Communication Department, specializing in conflict resolution, and created a new major and certificate program in conflict resolution. Courses in this area included mediation and conflict resolution, service learning in conflict resolution, small group communication, and human communication theory. He twice had the pleasure of being a UW-Green Bay Teaching Scholar, and during 2014-15 he was a UW-System Teaching Scholar. Joshua Korenblat (Graphic Design)has worked as an art director, artist, writer, and educator. He has an M.F.A. in Interdisciplinary Visual Art from the Maryland Institute College of Art, an M.A. in Teaching from Brown University, an M.A. in Writing from Johns Hopkins University. He also holds a dual-degree B.F.A. and B.A. from Washington University in St. Louis in Printmaking/Drawing and Comparative Literature (Italian). From 2007 until 2014, Joshua was on the Graphic Design faculty of the Boston University Center for Digital Imaging Arts, Washington, DC campus, a certificate program offered by the Boston University College of Communication. Joshua has seven years of experience in the Art Department at National Geographic Magazine and Science News. Joshua is also a co-founder and Art Director at Graphicacy, an information graphics and data visualization firm. Heather Lai (Mechanical Engineering) spent the past 10 years in Detroit, Michigan, and for the past three years taught engineering design in the Biomedical Engineering Department at Wayne State University. Her prior experience includes five years at Motorola Inc. as a product engineer and, later, a technical expert in the area of vibration. She has also taught mechanical engineering courses as an adjunct at Wayne State, Wilbur Wright College, and Triton College. Her interests include the areas of dynamics, vibration and musculo-skeletal biomechanics, as well as engineering education and developing creative means for student growth in the STEAM areas. Chantal Larose (Business – Statistics) earned her Ph.D. in Statistics at the University of Connecticut. Her dissertation is entitled “Model-Based Clustering of Incomplete Data.” In addition to her research, Dr. Larose has co-authored two textbooks in data analytics. The latest, “Data Mining and Predictive Analytics” (second edition), was published in 2015. Angela Lebbon (Business – Management) specializes in performance management techniques that improve employee motivation, productivity, and safety. She has corporate experience with a large Fortune 500 company in global organizational effectiveness and consulting experience in various industries, including manufacturing, energy and utilities, healthcare, and food services. Her research has been published in a number of peer-reviewed journals. Angela received her Ph.D. in Behavior Analysis (emphasis in Organizational Behavior Management) and her M.A. in Industrial/Organizational Psychology from Western Michigan University. Sang-Youn Lee (Youn) (Business) earned his Ph.D. at Washington State University, focusing his research on areas of foreign IPO performance and the effect of nation-level social institutions on entrepreneurship. He worked at Korea Telecom (KT) for thirteen years, where he directed Corporate Venture Capitalism and was an advisor to the CEO. Lee thoroughly enjoys teaching and engaging fellow scholars in sharing intellectual knowledge. He has taught Business Strategy, Principles of Management, and International Business. Jongkyum Kim (Business – Accounting) received his bachelor’s degree in Business and master’s degree in Accounting in South Korea and a second master’s degree in Accounting from Indiana University at Bloomington. He is currently completing his Ph.D. dissertation at Rutgers University. James Minas (Business) received his Ph.D. in Operations Research in 2013 from the Royal Melbourne Institute of Technology (Australia). Most recently, he was Assistant Professor of Operations and Decision Sciences in the School of Business and Economics at Wilfrid Laurier University (Canada). His teaching interests include business analytics, decision sciences, operations management and statistics; his research interest is in the application of quantitative methods to complex management problems in various domains including disaster and emergency management, healthcare operations and supply chain management. Scott Minkoff (Political Science) holds a Ph.D. in Political Science from the University of Colorado at Boulder and a B.A. from Skidmore College in Saratoga Springs, N.Y. He was an Assistant Professor at Barnard College for four years prior to coming to New Paltz. His research and teaching focus on American politics with an emphasis on local politics, political participation, political geography and public policy. He is currently working on a project mapping public goods quality and social capital within cities so as to better understand the connections between government policies, neighborhood life and social-political involvement. Jennifer Mokren is the Dean of the School of Fine & Performing Arts. She holds an M.F.A. in jewelry/metalsmithing from the University of Illinois at Urbana-Champaign. She was most recently Chair of the Art and Design Department and Associate Professor of Art at the University of Wisconsin-Green Bay. In her artwork she employs traditional beadwork and metalsmithing techniques to create wearable pieces that reference modernist design. Maura Musso ’94 (English) (Elementary Education) feels fortunate to have been part of the Department of Elementary Education for the past three years as an Adjunct Instructor and Lecturer. She also served as a Reading Specialist in the New Paltz Central and Arlington School Districts, helping future teachers become top literacy educators. Dorothy Pariot ’92g (Pre-K-6: General) (Elementary Education) holds B.S. and M.S. degrees in SUNY Geneseo and SUNY New Paltz, respectively. She has also completed the Massachusetts College of Liberal Arts’ (MCLA) Leadership Academy program in School District Administration. Prior to her appointment as Lecturer, she taught at New Paltz for two years as an adjunct. She has many years’ experience as an early childhood educator, public school administrator, teacher evaluator and literacy program coordinator. Lou Pietrogallo (Education) is a retiree from the Beacon City School District, where he taught Social Studies 7-11 for seven years. In addition to teaching, he has held several administrative positions including High School Assistant Principal, Middle School Principal and Elementary School Principal in the Wallkill Central School District. He has also taught courses in middle-level education at Mount Saint Mary College. At SUNY New Paltz he will instruct courses in Creating Inclusive Elementary Classrooms and Differentiating Instruction at the Secondary Level. Aiko Pletch (Haggerty English Language Program) received her M.A. in Applied Linguistics at Concordia University in Montreal, Canada, in 2011; she earned her B.A. from McGill University. She has been teaching ESL for over 10 years, including in recent years as an adjunct at SUNY New Paltz, where she taught as an adjunct lecturer. Vanessa Plumly (Languages, Literatures & Cultures) received her Ph.D. in German Studies from the University of Cincinnati. She has had research published in the “German Studies Review and in “Die Unterrichtspraxis.” She also served two years as co-editor of the “Focus on German Studies” graduate student journal and has organized and co-chaired seminars for the German Studies Association in the field of black German studies. Plumly is the recipient of numerous research fellowships and grants including the German Academic Exchange German Studies Summer Fellowship, the Taft Dissertation Fellowship and the University Research Council Grant. Sarah Rowley (U.S. History) received her Ph.D. in history from Indiana University in 2015. Her research and teaching interests cover the intersections of popular culture and politics in the modern United States, especially in the realms of gender and sexuality. Her dissertation deals with the rise of abortion politics in the 1960s-1970s. Lara Santoro (Languages, Literatures & Cultures) received her Ph.D. in Italian Literature from Rutgers University in 2011. She has taught Italian at the college level in the U.S. for the past 13 years at the University of Delaware, Rutgers University, Columbia University and the University of Massachusetts Amherst. Her research interests include 20th– and 21st-century Italian literature and film, Mafia studies and translation studies. Heather Shimon (Sojourner Truth Library) received her M.A. in Library and Information Studies at the University of Wisconsin-Madison, where she worked for the last two years as a librarian and course instructor at the engineering library, Wendt Commons. At UW, Heather also served on campus library committees focusing on diversity and instructional design. Before joining the engineering library, Heather worked for seven years as the assistant to the UW System Women’s Studies Librarian and for a brief time as the media librarian for the UW-Madison film department. Heather’s research interests include the affective domain of instruction and how to incorporate the library into the college experience for all students. Megan Sperry (Digital Media & Journalism) is a documentary filmmaker and educator. Her projects include films, published news articles, still photography and multimedia installations, all with a focus on social change. Sperry’s first feature-length documentary film, “The Domino Effect” (2012), about the re-development of the Domino Sugar factory on the Williamsburg waterfront in Brooklyn, NY, has screened at notable venues such as the Church Center for the United Nations, The Goethe Institute in NYC and the Austrian Museum of Architecture. Sperry is currently working on another documentary film that advocates for affordable housing options for formerly incarcerated women. Dimitry Tetin (Graphic Design) is a graphic designer with a multi-faceted design and teaching practice. He earned his B.A. in literature, ecology and evolutionary biology from the University of Chicago. An interest in semiotics and critical theory led him to study typography and visual communication at the School of the Art Institute of Chicago, where he received his B.F.A. He spent three years working as an Art Director at the Chicago Tribune before moving to the east coast and earning his M.F.A. at Rhode Island School of Design. Prior to moving to the Hudson Valley, he taught at RISD and The New School’s Parsons School of Design. He works on publication, web, identity, motion and environmental design projects for clients in the commercial and not-for-profit sectors. In his research and design practice he explores themes of perception and understanding of space and the role proper names play in conceptualizing places and entities. Alexander (Sasha) Tulchinsky (Biology) received his Ph.D. in Organismic and Evolutionary Biology from the University of Massachusetts Amherst in 2013. His doctoral research examined the evolution of gene regulation and its role in reproductive isolation between species. He is interested in using computational methods to study evolution; integrating evolutionary thinking into undergraduate biology education; and designing biology courses that foster intellectual curiosity and evidence-based reasoning. Bria Walker (Theatre Arts) is a multi-disciplinary artist received her M.F.A. from The National Theatre Conservatory in conjunction with the Denver Center for the Performing Arts and held a Lecturer position at the University of Pittsburgh prior to coming to SUNY New Paltz. She recently starred in “SAINTS TOUR,” a site-specific immersive-theatre piece, in Pittsburgh, Pa. with Bricolage Production Company. Special teaching interests include Viewpoints, devised theatre, and career prep. Lesley Wamsley ‘12g (Painting-Drawing) (Fine & Performing Arts) joins the Foundations faculty after receiving her M.F.A. in Painting and Drawing from SUNY New Paltz in 2012 and teaching as an adjunct in the program in the time since. Both her teaching and studio practice examine the process and history of drawing. Her work has been shown throughout the East Coast, and she is currently the artist-in-residence at Endless Editions in New York City. Lydia Willoughby (Sojourner Truth Library) is a Research and Education Librarian with a Master’s in Library and Information Science from Long Island University (2011), as well as a Master of Arts in English Literature from The University of Montana (2006). Willoughby’s scholarship draws parallels in access to literacy and access to information and technology. Her research interests include critical and feminist pedagogy, gamification in education and online learning and emerging technologies. In 2013, Willoughby was selected as a “Library Journal” “Mover & Shaker” in the community builder category for her work in advocacy for rural libraries in Vermont. Ji Yu (Accounting) earned a Ph.D. in Business Administration (concentration in accounting) from the University of Memphis. Yu’s research interest is in the field of financial accounting. His current research covers topics including initial public offering underpricing phenomenon, corporate social responsibility and corporate governance. He has presented scholarship at conferences including the Financial Management Association International annual meeting. His teaching interests are financial accounting and managerial accounting. Russell J. Zwanka (Business – Marketing) has taught Marketing and Business Strategy at Siena College and Hudson Valley Community College. Known as “Dr. Z” to his students, Zwanka currently serves as CEO of Triple Eight Marketing, a retail food industry consultancy working on developing customer-centered, integrity-first approaches to all customer connectivity areas of the business. He has worked extensively as a merchandising and marketing executive for retail and wholesale grocery companies in domestic and international markets, including Price Chopper, Ahold, Bozzutos, Inc. and the North West Company. Zwanka holds a D.B.A. in international business, a M.S. in management and a B.S. in psychology. Dr. Z is the author of five books. His latest release, “A Marketing Manual for the Millennium,” is now available in over twenty countries.